Dinosaur Backpack. Raptor Backpack. Velociraptor Backpack. The perfect tag along for any young dinosaur crazed student. This ferocious raptor backpack will protect delicate school books and homework. The Raptor backpack, has a 3D relief on the Dinosaur for texture, bringing the picture to life. It also has the "Velociraptor" name on the picture. A convenient backpack to have, with two large compartments for carrying books and school supplies. A carrying handle on the top of the bag, water compartments on either side of the bag, with comfortable padded shoulder straps that are adjustable for all kids. 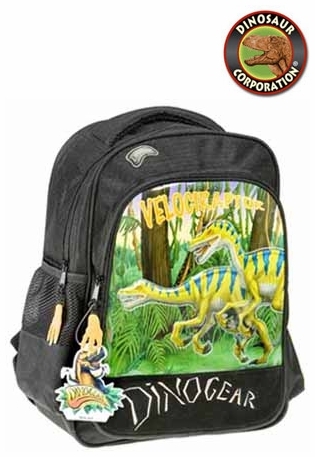 It has a "DinoGear" logo at the bottom of the backpack, for that extra cool touch!